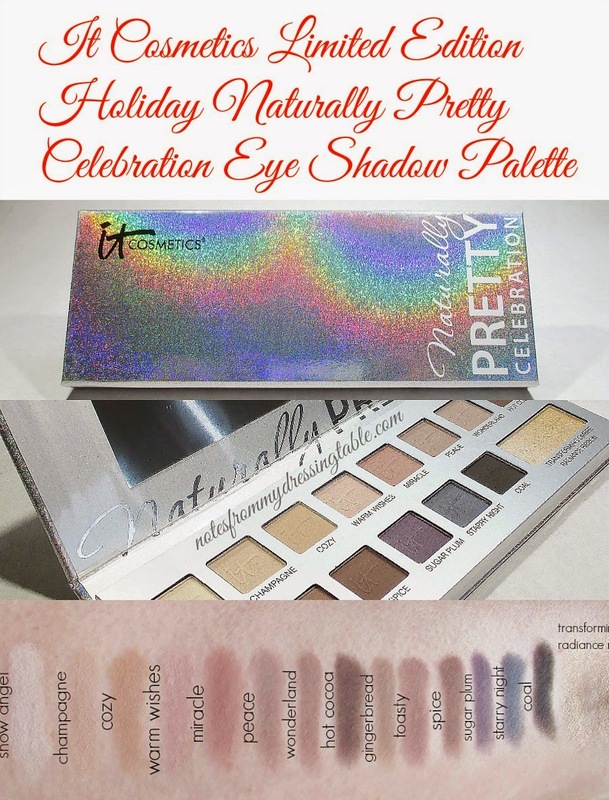 The IT Cosmetics Limited Edition Holiday Naturally Pretty Celebration Matte Eye Shadow Palette, $42.00 is a hell of a mouthful of a name. And, a pretty nice eye shadow palette, too. When you take this palette out of it's outer box, the first thing you notice is that, unlike it's sister palette, the IT Cosmetics Naturally Pretty Volume 1 Matte Luxe Transforming Eye Shadow Palette (reviewed here) the Celebration Matte Palette - sorry, I am not typing out that long name every time - is a sleek, well constructed paperboard palette with a beautiful rainbow holographic effect decorating the exterior. Honestly, I'd have probably bought the palette just for the packaging. I mean, look at how sparkly! And this palette is easy to keep clean, no having to store it in it's outer box. Open the lid by simply lifting the fold over magnetized lip and the interior of the palette is finished in silver, with the sparkly holo effect around the edges. There is a fair sized mirror in the lid to assist you in your get pretty routine, should you need it. There are fifteen pans of pressed eye shadow, fourteen matte shades and one shimmery shade called the Transforming Ombre Radiance Ribbon. Okay! I am a wordy thing. I freely acknowledge that but the names on and of cosmetics are getting a little crazy, am I right? The eye shadows in the IT Celebration Matte Palette are wearable neutrals and well laid out in a fashion that makes sense to the eye as well as for composing eye looks. The shade range is light to deep, there are both warm and cool tones but this palette swings cool, overall. The radiance ribbon is meant to transform mattes to soft shimmers and for highlight. Each of the pans are stamped with the IT Cosmetics logo. Here are swatches of the shadows, running left to right, top row to bottom. I swatched over primer, as that is how I wear eye shadow. Overall, the quality of this palette is very nice. The matte eye shadows are soft, smooth and creamy to the touch. A couple of shades, Coal and Hot Cocoa were a little stiff and take a little care in application and blending but they are very workable. These shadows are a little bit more powdery than the shadows in the Volume 1 palette and I had to cope with some minor fallout with the deeper shades. The Transforming Ombre Radiance Ribbon is a golden to champagne shimmer. This shadow is highly reflective, easy enough to use, I just don't dip into it all that often. I would have preferred it to be a large, ivory matte for highlighting and have another matte mid tone shade, instead. But, that's just me. The pigmentation on these shadows is good, the payoff on the eyes is good. These shadows can fly away or get a bit muddy of over blended. I get the best result by applying over a primer and not working them too much. These are not powerhouse eye shadows. They are softer, gentler in colour and tone. If you like a more subtle, blended eye shadow look, this palette may be for you. If you are into intense, deep, smokey looks, you may not find this palette to be your cup of tea. For an easy day to day eye look, I dig this palette. It delivers that subtle, neutral look that is my usual. Did I really need it? Probably not. It's sister palette works much the same way for me. I was sucked in by the sparkly packaging and my compulsion to #ownalloftheeyeshadows in the world. What can I say? Some of you are into lippies, others can't lay off of blushes or highlighters. For me, it's eye shadows. I don't regret buying this palette. I had an Ulta coupon, some rewards points which made it a good deal and I am using and enjoying it so it was a good purchase for me. 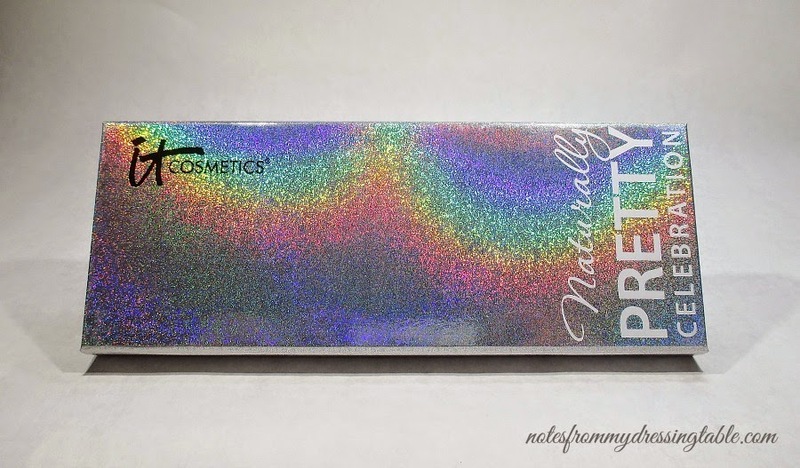 If you would like to check out the IT Cosmetics Limited Edition Holiday Naturally Pretty Celebration Matte Eye Shadow Palette (seriously... that name) it is still available on the Ulta website and the last time I was in my local Ulta store, there were still quite a few in stock. Pop in, swatch the tester and see what you think. Do you own this palette? What do you think of it? Please share your thoughts, I'm interested to know how others who own this palette feel about it. Such a gorgeous palette! I definitely prefer this one over last years! 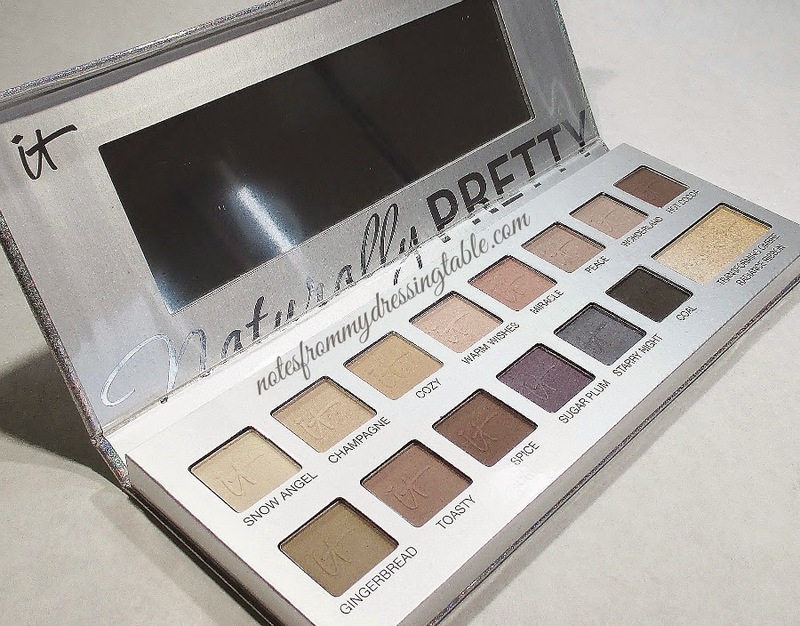 Awesome palette of neutral eye shadows. The packaging for this is amazing. Look at that holo cover. I bought this and love it so far. These colors are so pigmented! Very petty! Can you not love the cover of this palette!!?? I love the shades in this palette! very universally flattering. I love that you caught the rainbows on the packaging! Can you believe I haven't tried a single thing from IT? that should change this year! I may use my Ulta 20% off coupon on this...I love IT, but am mad at Ulta! this palette is gorgeous... I have to try something from IT... I haven't had the chance to yet. I'm with you--eyeshadows are my crack! I probably shouldn't have read this b/c now I have to have it! Thanks a lot Erika! Yay! I'm glad that you love it, too. Hee! Hee! Hee! Evil enabler mode- Activated. You should. It's a loverly palette if you like matte neutrals. Giiiirl! IT is good stuff! I need to talk about the foundation I've been using. It's wonderful! It is, inside and out. I admit, the sparkles got to me. My coupon will likely get me the Semi Sweet. Why are you mad at Ulta? IT is good! I LOVE their foundation. Nope. I can stare at it, for ever. That packaging is evil. Sucked me right it. And the shadows are lovely. Wow. Really. Good to know. I don't use last year's as often, now that I have this one because I don't like hauling it out of it's box. This is a beautiful palette. I'd probably pick it up if I didn't have a million other neutral palettes. I still *have* to try something by IT Cosmetics, though!